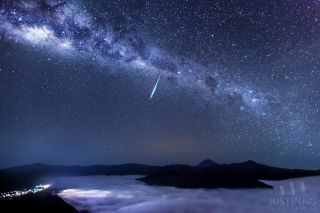 This year, the Eta Aquarid meteor shower is predicted to peak early on Tuesday morning, May 6, but will also be visible late at Monday night (May 5). Under ideal conditions (a dark, moonless sky) up to 60 of these very swift meteors might be seen per hour. The shower appears at about one-quarter peak strength for several days before and after May 6. If bad weather or bright city lights spoil your view, you can watch webcasts of Eta Aquarid meteor shower Monday night, courtesy of NASA and the Slooh community telescope. This year will be a very good year to watch for them because the moon will be one day from First Quarter phase which means it will have long since set when the stars of the constellation Aquarius make their appearance in the southeast sky during the early morning hours and will provide absolutely no interference to viewing these swift streaks of light. There is, however, a bit of a catch. From places south of the equator, the Eta Aquarids put on very good show; Australians consider them to be the best meteor display of the year. But for those watching from north of the equator, it’s a much different story. The radiant (the origin point of these meteors) is within the "Water Jar" of the constellation Aquarius, which begins to rise above the eastern horizon around 3 a.m. your local time, but unfortunately, never really gets very high as seen from north temperate latitudes. And soon after 4 a.m., morning twilight will begin to brighten the sky. So if you're hoping to see up to 60 meteors per hour, forget it. With the radiant so low above the horizon, the majority of those meteors will be streaking below the horizon and out of your view. In fact, from North America, typical Aquarid rates are only 10 meteors per hour at 26 degrees north latitude (for Miami, Florida, or Brownsville, Texas); five meteors per hour at 35 degrees latitude (Los Angeles, California or Cape Hatteras, N.C.); and practically zero to the north of 40 degrees latitude (New York, Chicago, and Philadelphia). "So," you might ask, "What's the point of getting up before dawn to watch?" The answer: You might still see something spectacular. For most, perhaps the best hope is perhaps catching a glimpse of a meteor emerging from the radiant that will skim the atmosphere horizontally — much like a bug skimming the side window of an automobile. Meteor shower watchers call such shooting stars "earthgrazers." They leave colorful, long-lasting trails. "These meteors are extremely long," says Robert Lunsford, of the International Meteor Organization. "They tend to hug the horizon rather than shooting overhead where most cameras are aimed." "Earthgrazers are rarely numerous," cautions Bill Cooke, a member of the Space Environments team at the Marshall Space Flight Center. "But even if you only see a few, you're likely to remember them." If you do catch sight of one early these next few mornings, keep in mind that you'll likely be seeing the incandescent streak produced by material which originated from the nucleus of Halley's Comet. When these tiny bits of comet collide with Earth, friction with our atmosphere raises them to white heat and produces the effect popularly referred to as "shooting stars."